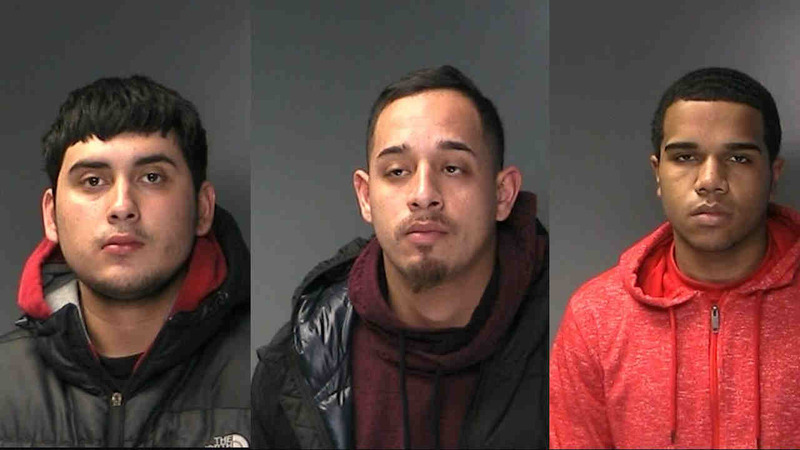 MELVILLE, Long Island (WABC) -- Three men were arrested on Long Island after police said one threatened to kill a clerk on Tuesday. According to the Suffolk County Police Department, Hector Gonzalez entered the 7-Eleven on Walt Whitman Road in Melville, and asked to purchase cigarettes at about 11:05 a.m. The clerk denied the request because Gonzalez did not have proper identification. Police said Gonzalez then went to his car, and returned with two other man and what appeared to be a gun in his waistband. He threatened to kill the clerk, Suffolk police said. The clerk wrote down the license plate of the vehicle, but one of the man pulled the paper out of the victim's hand. Gonzalez, Oscar Madrid and the third man, Timothy Flythe, fled in a vehicle that Gonzalez' mother was driving. The vehicle was pulled over in Farmingdale around 11:20 a.m.
Gonzalez, 26, of Huntington Station, was charged with menacing and a bench warrant. Flythe, 18, of Huntington Station, was charged with two counts of criminal possession of a weapon. Oscar Madrid, 18, of Huntington Station, was charged with grand larceny. The three are scheduled to be arraigned Wednesday.